Asian Americans for Equality (AAFE) is a non-profit organization dedicated to enriching the lives of Asian Americans and all those in need. Founded in 1974 to advocate for equal rights, AAFE has transformed in the past four decades to become one of New York City’s preeminent housing, social service, and community development organizations. AAFE is committed to preserving affordable housing throughout New York City and to providing new opportunities for the city’s diverse immigrant communities. The College Counselor supports AAFE’s mission to empower immigrant communities by providing counseling services that help high school youth identify post-secondary options and access educational resources. The College Counselor will work out of the College Office in Flushing High School and report to the Program Manager of Youth and Family Development. Provide support for youth and family-related programming and AAFE events as needed (i.e. college visits, career conferences, community service events, parent events, etc.). 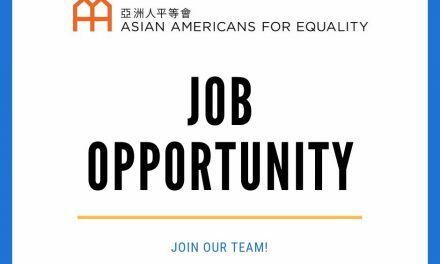 This position is based out of the College Office at Flushing High School from 9:00 am – 3:45 pm, and at AAFE’s Union Street office from 3:45 pm – 5:00 pm, with lunch breaks from 12 pm – 1 pm, Monday to Friday. Occasional evening and weekend hours are required for community outreach and professional trainings. The position requires sitting, standing and walking in and outside of the office. Occasional lifting and carrying of a weight of 30 lbs of event materials and office supplies. Salary is commensurate with experience. AAFE offers a competitive benefits package, including full health insurance (following a 30-day waiting period), retirement savings plan, flexible spending, and paid time off. Please email a cover letter with salary expectations and a resume in PDF format, indicating “College Counselor” in the subject line by April 25, 2019 to gabriel_hisugan@aafe.org. Asian Americans for Equality is an equal opportunity employer (EOE). People of color, community residents, and women are strongly encouraged to apply.